The Safari Wild Cats bedding set includes a reversible comforter, a pillowcase, and two decorative pillows in a safari theme, featuring a lion’s head and a Jeep 4X4. You’ll fall in love – not once, but twice! – with this fantastic comforter for kids. One side has a wildcat pattern: cheetahs, tigers, and panthers; and the other features rows of paw prints, for a modern look. Make the savanna theme your own – this bedding set is great for sending your little boy off to dreamland! You’ll love the theme, which we’ve reworked in more neutral colors to help you create a more comfy bedroom look that’ll stay with him through the years. We like simplicity – especially with kids’ bedding, which needs frequent cleaning, as we all know. Just machine wash it separately, in cold water with no bleach, then tumble dry at a low temperature. For a crisp, clean look, iron it at a low setting. 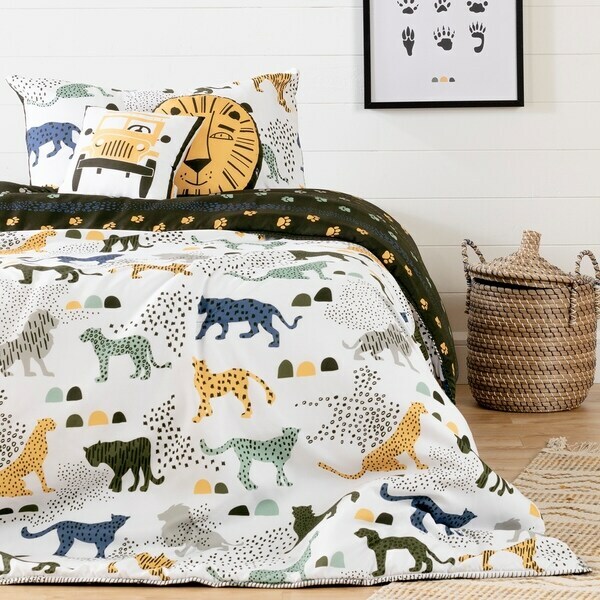 South Shore is proud to stand behind this kids bedding set: comforter, pillowcase and decorative cushions safari wild cats with an exclusive 30-day limited guarantee. Shop with confidence knowing your purchase is always covered. All our products meets or exceeds North American safety standards and our packaging are tested and certified to reduce the risk of damage during shipment. This item it shipped in 1 box. Other accessories not included. REVERSIBLE COMFORTER: Spread the comforter on the bed, animal or paw print side up – whichever you prefer. Both sides are in the same color palette, so matching this piece to the rest of your kid’s room is easy! SET WITH PILLOWS: One click shopping! This set includes the reversible comforter, pillowcases, and two attractive themed pillows. WILD ANIMAL THEME: Imagine you’re on safari – you’ll find wildcats of the savanna, such as panthers and cheetahs, right there in your kid’s room. MACHINE WASHABLE: You can machine wash the comforter in cold water and tumble dry it at a low temperature. It’s that easy! 30-DAY LIMITED GUARANTEE: South Shore is proud to stand behind this kids bedding set: comforter, pillowcase and decorative cushions safari wild cats with an exclusive 30-day limited guarantee. Shop with confidence knowing your purchase is always covered. Dimensions 88.0 In. X 64.0 In. X 1.0 In.